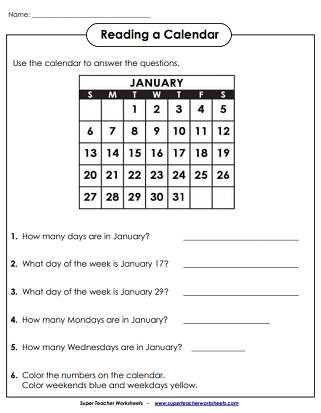 These printable worksheets will help your students learn about days, weeks, months, and years. Use the calendars shown to answer math questions. Answer questions about the January calendar. Students answer questions like, "How many Mondays are in January?" and "What day of the week is January 29?" Use the yearly calendar to answer basic questions about months and days of the week. Trace the days of the week words and cut them out. Glue them onto the chart in order. Write the name of this month, last month, next month. Also write your birthday month. Spin the wheel and read the days of the week. Can you tell which day will come next? This cut-and glue activity will help kids learn about days of the week and yesterday-tomorrow-today. Spin the wheel and read the months of the year. Can you tell which month will come next? Answer questions about the April calendar. Students color all of the Saturdays red and Thursdays green. Then answer questions like, "If today is Tuesday, what will tomorrow be?" Cut the months squares and glue them onto the chart in order. This version includes holiday pictures, such as Santa Claus shamrocks, and a Thanksgiving turkey. Cut the months squares and glue them onto the chart in order. This version does not have holiday pictures. Fill in the missing days of the week and months. Write an ordinal number for each month given. Answer questions about the October calendar. Students answer questions like, "Columbus Day is celebrated on the second Monday is October. What is the date of Columbus Day?" Answer questions about the October calendar. Students answer questions like, "Mark's birthday is on March 24. His party is exactly two weeks later. What is the date of his party?" 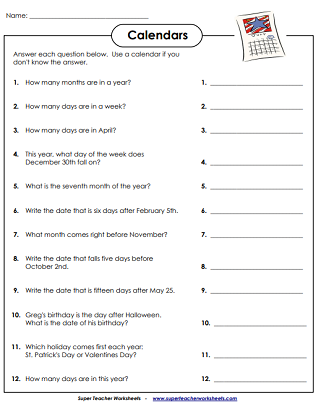 This worksheet features elapsed time calendar questions. For example, "How many days are there between Valentine's Day and St. Patrick's Day?" Remember how many days each month has when you memorize the classic poem, "Thirty days has September, April, June, and November..."
Abbreviate each day of the week and month of the year. These cards can be used on your classroom word wall, or with a pocket chart. Words include: Sunday, Monday, Tuesday, Wednesday, Thursday, Friday, Saturday, and Sunday. These word wall or pocket chart cards can be used to help students learn the names of the twelve months of the year. Make your own calendars with STW's custom calendar generator. Choose the month and year, then add your own special dates. Kids love these blank calendars for each month of the year. They can color the pictures, fill in the dates, and include their favorite holidays and birthdays. 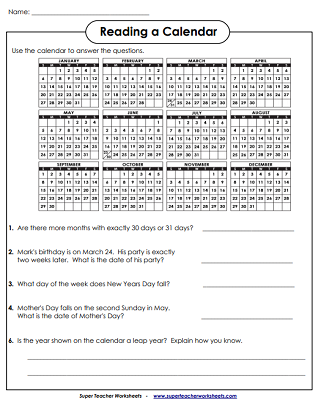 Teach your students to calculate the passing of time with these elapsed time worksheets. Practice reading analog clocks with these worksheets, games, and printable activities.